60 years / when years matter. 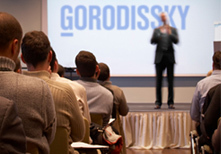 Gorodissky & Partners. Breaking news. Gorodissky & Partners. Takes a floor in Stockholm. IP Firm №1 in Russia. All subject-matters of IP rights. 15 February - 26 April 2019	Training program "Legal Protection of Intellectual Property Subjects Abroad"
26 April 2019	Seminar "Practice of antimonopoly regulation"
12 April 2019	Seminar "How to avoid violation of third party IP rights in the course of exporting and advertising goods and services"